You know what ladies love? A man who can handle his tools. What do the ladies love even more? A man who can say checkmate. Well, except maybe this lady. But, what about those of us lacking grandmaster status? 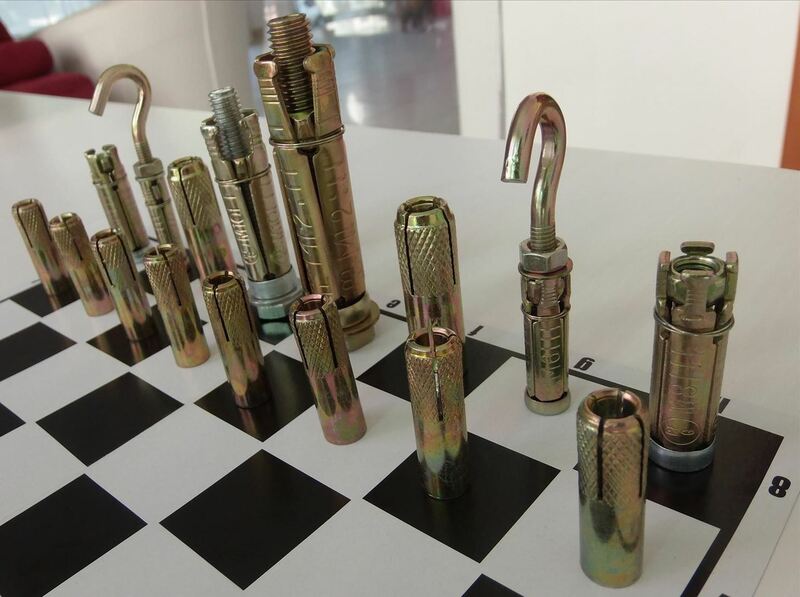 We can use those tools were so good with to show off our intelligence in a different manner—like with this ingenious DIY chess set made from nuts and bolts. 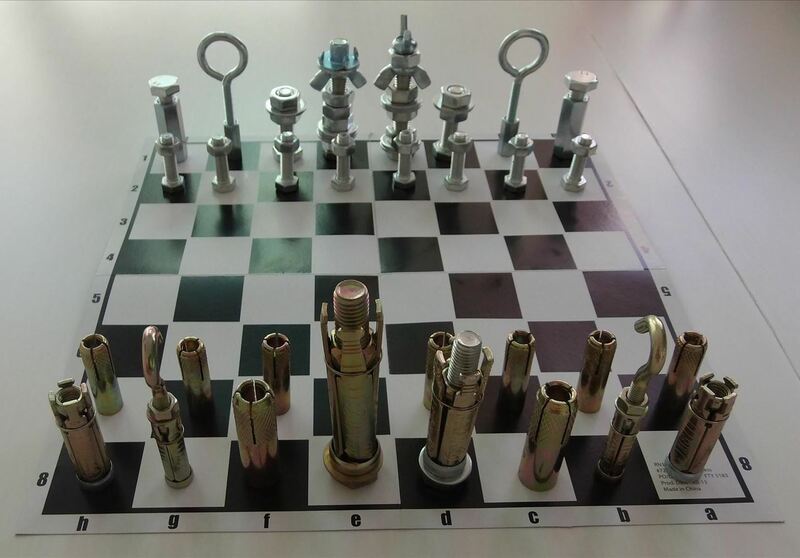 If MacGyver played chess, this would surely be his set (though, there might be some duct tape in there somewhere, too). How awesome is this? 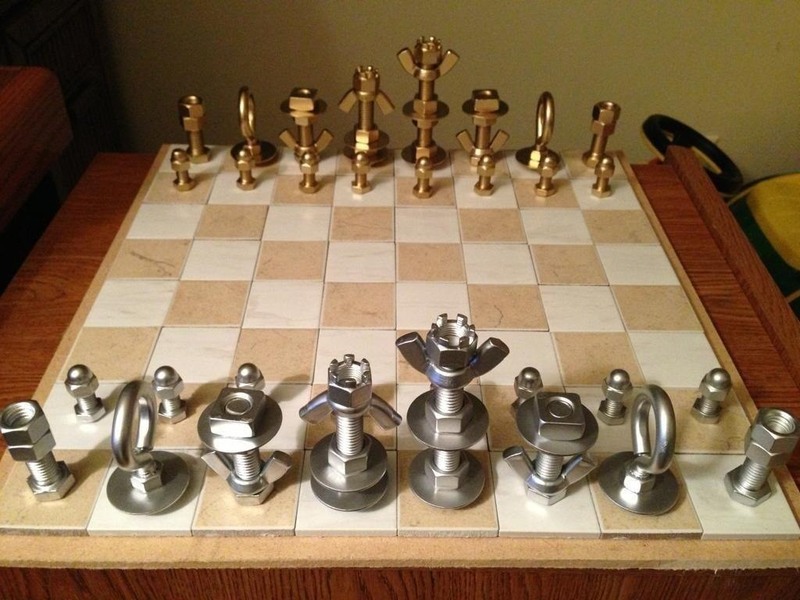 Even if you don't play chess, this will make you want to start. Plus, it's relatively easy to make and customizable. 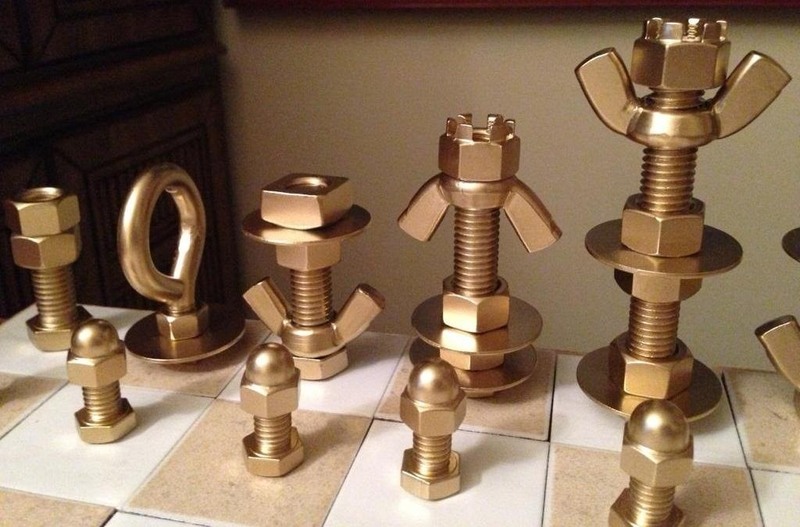 The above clay tile chessboard and nuts and bolts chess pieces come from Reddit user shama_lama_ding_dong (two points for the name alone). After a lengthy trip to Home Depot, he picked up a boatload of different bolts, nuts, and screws to complete his masterpiece. 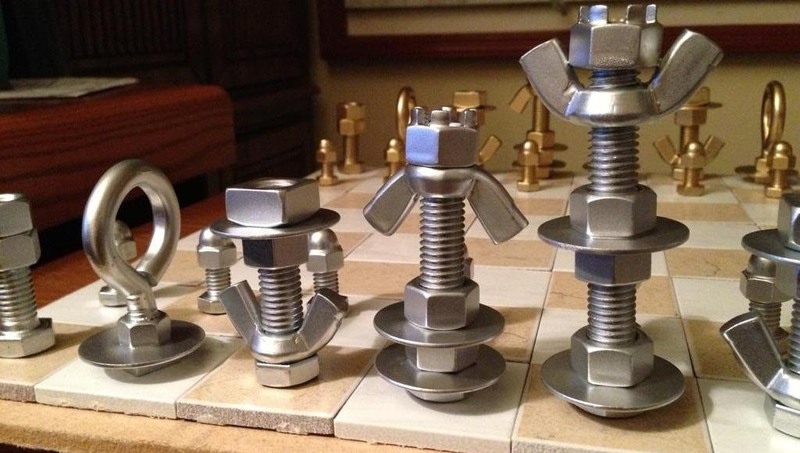 However, his is not the first to use nuts and bolts for pawns and queens. Julia Suits made the ones pictured below, though, the chessboard leaves something to be desired. Julia was nice enough to provide a breakdown of the pieces used for her pieces and pawns, as well as a ton pictures. Now, for any of you who actually know anything about chess, you'll already know that pawns are called pawns and the rest of the army are called pieces. Why? I'm not sure, but that's the deal. Now, onto the nuts and bolts. If you don't mind having hardware around the house, I'd just opt for the small packs of each kind. They can come in handy for common household fixes, or for spare chess parts. But it can get pretty expensive. Keep in mind that for this project, you'll want to get brass-colored for one side, and regular shiny silver (zinc) ones for the other side, so split everything in half and you'll be good. That means it might be better to go solo and skip the multi-packs. Unless you plan on painting your white or black army, then it doesn't matter. If you already have most of these, good for you. You're a step ahead. Pawn (16 ea.) = ½" hex bolt (1½" tall) + 1 flange hex nut. Now, obviously this is not how you have to do it. Some of those pieces are pretty expensive, so you may want to opt for cheaper hardware—or hardware you already have around. How many of you have internally toothed washers? Yeah... so use regular washers. The goal is to create a set that works and looks great, the exact pieces are up to you. Getting creative and opting for standard pieces could save money and time wasted at Lowe's or Home Depot or wherever you buy your nuts and bolts. For the board, you can use any old chessboard, or try out shama_lama_ding_dong's bathroom tile board. You just basically need 64 small clay tiles, 32 for each color you choose. 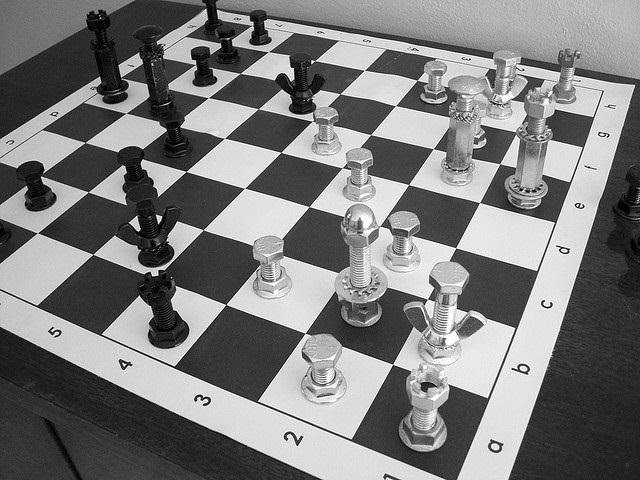 If you try making your own DIY chessboard and pieces, make sure to share some pics below. This idea saved my bacon at a recent Christmas party where we all had to take a gift we had made. After going to 2 different hardware stores i came up with this set, see pics. The present went down really well and I'll definitely be making more. Only problem is the board as haven't managed to find the small tiles so used a regular chess board from a set, it is just a cardboard one. Ooo, I love it! What hardware pieces did you use? I'm excited to finally find a cool gift that I can make for my dad this Christmas! We are making all of our gifts for our exchange this year. Thanks for the idea! I'll post pics when I'm done.